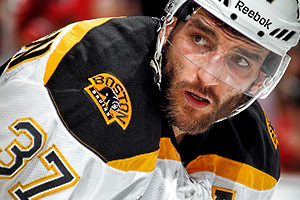 Boston, MA - Boston Bruins General Manager Peter Chiarelli announced today, July 12, that the club has signed forward Patrice Bergeron to an eight-year contract extension through the 2021-22 season. Bergeron’s salary is worth an annual cap figure of $6,500,000. Bergeron and Chiarelli will be available to media via conference call on Friday, July 12 at 12:30 p.m. ET (follow @NHLBruins on Twitter for updates). In 42 regular season games in 2013, Bergeron notched 10 goals (tied for fourth on the team) and 22 assists (second on the team) for 32 points (tied for third on the team) with a team leading plus-24 rating (sixth in the NHL). He led the NHL in faceoff percentage in 2013, winning draws at a 62.1% rate (549-for-844), and was plus or even in 37 of his 42 games. Over the last two seasons, the centerman has combined for a 60.3% faceoff win percentage and plus-60 rating, which ranks first overall in the NHL during that span. In the 2013 postseason, the 27-year-old accumulated nine goals (tied for first on the team and tied for second in the NHL) and six assists for 15 points (tied for third on the team and tied fifth in the NHL). Bergeron won puck drops at a 61.5% clip in the playoffs, which led all skaters, winning 304-of-494 draws. The Bruins Alternate Captain earned two game winning goals in the Stanley Cup Playoffs, including a series-clinching overtime goal against Toronto in Game 7 of the Quarterfinal and a Game 3 OT tally versus Pittsburgh in the Conference Final. Bergeron’s three career playoff overtime goals tie him with Mel Hill and Terry O’Reilly for the most in club history. Bergeron won the 2011-12 Selke Trophy as the league’s top defensive forward and was a finalist for the award this season (finished second overall). Also in 2013, he was named the recipient of the King Clancy Trophy, which is awarded annually to an NHL player who best exemplifies leadership qualities both on and off the ice and has made a noteworthy humanitarian contribution in his community. In 579 NHL games – all with the Bruins – Bergeron has amassed 153 goals and 280 assists for 433 points with 180 penalty minutes and a plus-70 rating. Bergeron has registered 29 game winning goals from 2003-13, including a career-high six in both the 2005-06 and 2006-07 season. The Bruins centerman has skated in 83 career postseason games with Boston, accruing 20 goals and 37 helpers for 57 points with five game winning goals. Bergeron was a member of the 2011 Cup Championship team, contributing six goals (tied for seventh in the NHL) and 14 assists (tied for second in the NHL) in 23 games with a plus-15 rating (second in the NHL). The 6’2’’, 195-pound native of Ancienne-Lorette, Quebec was selected by the Boston Bruins in the second round (45th overall) of the 2003 NHL Entry Draft.